This program is strong, the season short, dance and music groundbreaking, the impact immense. Salute is the Royal New Zealand Ballet’s tribute to the country’s experiences at war, but it has much to offer the conscientious objector as well. There are two major premieres, one searing classic from the 20th century, and a bagatelle of most welcome levity. The utter futility, red carnage and grey grief of war is unambiguously referenced, yet there is also a dance of first love in peacetime, as poignant as anything all evening. I don’t often tell Australian cousins to cross the Tasman to come to the ballet, but I think I am suggesting just that for Salute—and hey, half the roll call of dancers is Australian. Andrew Simmons has had a number of commissions to choreograph for this company (outstandingly, Of Days. q.v.) and Dear Horizon is a welcome addition to the list. He responds with empathy to Gareth Farr’s remarkable music, which opens with a high tremolo from the brave solo cello, so quiet, so carrying, before the brass enters the fray. The ballet is dreamlike, dark shadowed, hazy, enigmatic. Time runs both forward and back. War means death, or damaged lives. Dancer Mayu Tanigaito is extraordinary, and designer Tracey Grant Lord’s evocative set of letters and red poppies is suspended on high above this poetic opener. Next is Soldiers’ Mass, for twelve men, Jiri Kylian’s masterwork made in 1980. 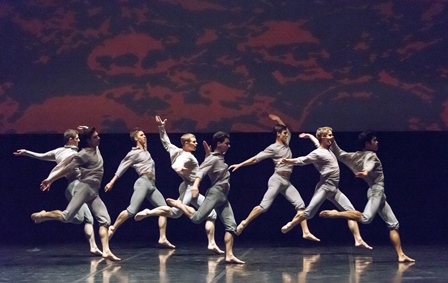 This marks a return season from 1998–1999 when Royal New Zealand Ballet first performed the work. Performers from that season have left the company now, but were remarkably evoked again here … Paul Mathews ‘playing’ Ou Lu, Shaun James Kelly ‘playing’ Shannon Dawson. Loughlan Prior and Joseph Skelton are transformed, but a phenomenal performance is given by one woman dancer called in to replace an injured male. Back then it was Pieter Symonds, ‘Joan of Arc comes to town’ I called it—well, Joan of Arc returned to town when Laura Jones, tall, young and spunky, replaced an injured male this weekend, but gave the performances of her life, as good as any man. Kylian has put a couple of telling movement quotes early in his piece to the ‘great’ (anti) war ballet of all time, Kurt Jooss’ The Green Table, and it’s too sad that politicians and armaments manufacturers don’t know these ballets as well as dancers do. The most remarkable truth about Kylian’s choreographic marathon is that, by the time of the Kyrie in the Martinu Mass, the dancers have actually metamorphosed into real soldiers. The effect is devastating, and makes it one of the finest works this company has ever brought into their repertoire. An interval is welcome but an ice-cream seems ridiculous, it’s cold here, though I don’t refuse when Jon Trimmer shouts me champagne. Soon we are back in the theatre, and it’s Salute, with Lumbye waltzes and galops from old-world Denmark, and a 19th century romp at the cadets prom, young girls all coy, the lads up for a lark, and a stitch of a sergeant-major. It’s a long way from a battlefield and one resists its charms for a while, till remembering, hang on, I’m still sipping champagne, and everyone around me is wearing sparkly earrings and a bit of dress-up, we are at the ballet after all, so Salute is no sillier than we are. Just because it’s full of biedermeier charm doesn’t mean the dancing’s easy. Lucy Green dances with Damir Emric and her serious first love tugs your heart. Neil Ieremia has made a colossus of a choreography in Passchendaele. It may be short by number of minutes but it brings that miserable battle home to us like nothing else. Of course all battles are miserable but I’ve always been especially choked by Passchendaele since hearing in a millenium documentary in 2000, where one soldier’s tale was of spending all day every day in a trench of mud up to his neck, close enough to see ‘the enemy’ yet unable to advance. Come nightfall, if you could get back through the mud you could expect some food rations but the only way to cross the sea of mud was to step on your fallen comrades, though only so long as they were lying face down, so their bony spines could offer you footfall. That might be the most disgusting thing I have ever heard in all history—that you went to war so as to die so your spine could be a footprint for your mate to go and get an army biscuit. The disappointment we all share is that war seems genetic in the human condition, and that ‘the Great War to end all wars’ has proved anything but. Historians seem to be still puzzling as to why it even happened at all. One of my great uncles lies buried ‘near the Somme’. Another returned but had been so badly gassed that he coughed and choked for the next 53 years back home. Which would be worse? Well, Ieremia has put all of this anger into his thundering dance. Abigail Boyle and Jacob Chown are on fire. All the dancers punch out the fight, and phrases from haka were never more tellingly choreographed on a stage. The composition is a tour de force by Dwayne Bloomfield, his own name echoed in the red and black back projections, the work of Geoff Tune. Out of sight but well within earshot are more dancers, not onstage but underneath it, playing snare drums to add to the orchestra pit swelling full of brass. The dancing women have to walk away and leave their men lying there motionless. There’s a knock on the door from the telegram boy, then a tune from a lone whistler in the dark. Curtain.